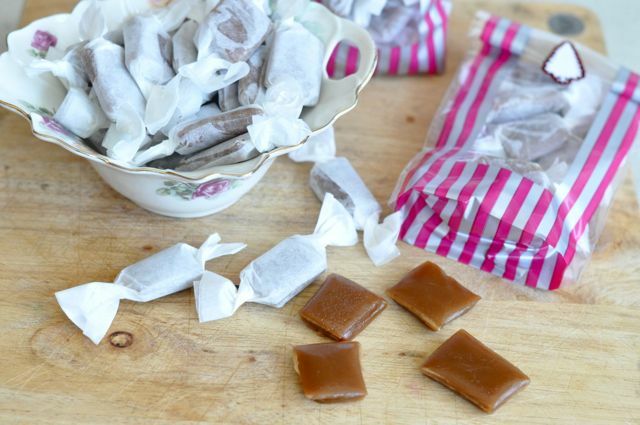 Chewy Salt Caramels…..or Tooth Pullers. Ok, so I have a confession to make….I made these before Christmas and totally meant to blog them so you cats could give them away as tightarse gifts too….alas, I had a little issue with my steam running out and I kinda let this one slide. I needed to do a pick up shot of the ingredients and I just, well, I couldn’t be arsed. It’s only three things…..here, let’s play a game…..close your eyes. No, no, you won’t be able to read this. Forget that bit. Imagine white sugar, brown sugar and cream all sitting on a wooden chopping board in the most fabulous arrangement humanly possible…..there it is. Probably more interesting imagined than real! If you’re feeling like making people Australia Day goodie bags then these are awesome, but I’ve never heard of anyone doing anything that patriotic. Aussies are more about sausages, lamingtons, beer and sunburn (and Triple J Hottest 100, yo!). Pop these into your arsenal (snigger, she said arse) for another day because they truly are delicious. 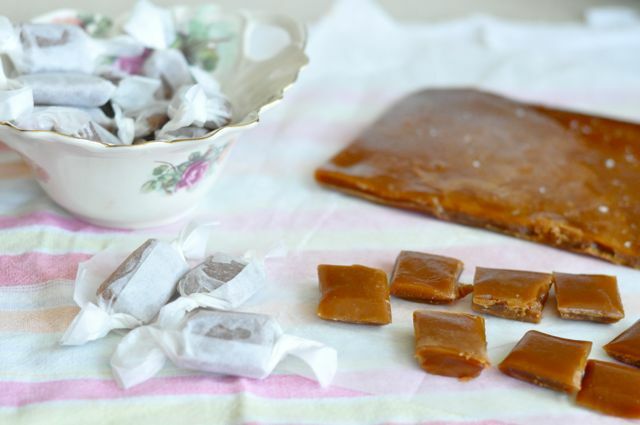 I have only three things to say to you regarding making caramels…. A candy thermometer is cheap and cheerful. You *should* check to see if it’s accurate but who can be arsed? You know I’m a cowboy so I’m not going to try to say I did. You do need to try to get it kinda close to the temps here thought otherwise it’ll be too soft or crystalise. My first batch was gold, and my second batch crystalised and turned to sandy , crystally, tasty mud. The reason for this was because I made not one, but two, of the toffee making cardinal sins. Don’t overheat by a single degree, and don’t make on a humid day unless you’re in aircon. Obviously, only an idiot would need this advice because everyone would know that it’s not just over 100C but it’s sticky and impossible to get off, and melts flesh on contact. I’m still waiting for taste buds and fingerprints to grow back. It bubbles quite a bit and I had a toff-tastrophe. 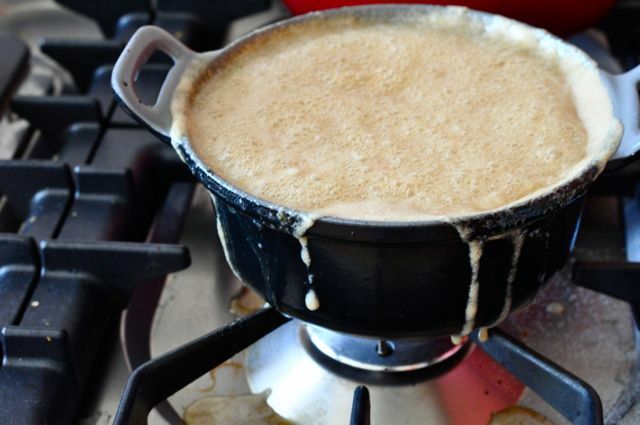 Mine boiled over and I didn’t want to mess with the temperature so I had to heat a new saucepan and just watch it spill all over the stove……d’ya think that’s easy to clean up? Line a 20×20 tray, or thereabouts, with baking paper. In a heavy medium sized saucepan, stir together the cream, sugars, and salt. Place the saucepan over medium high heat and bring to a boil, stirring constantly with a wooden spoon. Once the mixture boils, with a silicone cake scraper or wet pastry brush that has been dipped in warm water, wash down the sides of the saucepan to remove any sugar crystals that may have formed. Remove from heat and stir in the vanilla extract. Pour the caramel into your prepared pan, sprinkle with a pinch of sea salt, and let cool, undisturbed, for at least eight hours, or overnight. With a hot sharp knife, and elbow grease, cut into squares or rectangles.It’s not brittle so does not snap, it’s chewy so you really need to heat that knife. I dunked it in boiling water. After two batches, I ended up with RSI and after moaning about it on Facebook my friend over at Mrs D’s Maunderings sent me a toffee hammer in order to beat up my next batch to show it who’s boss. 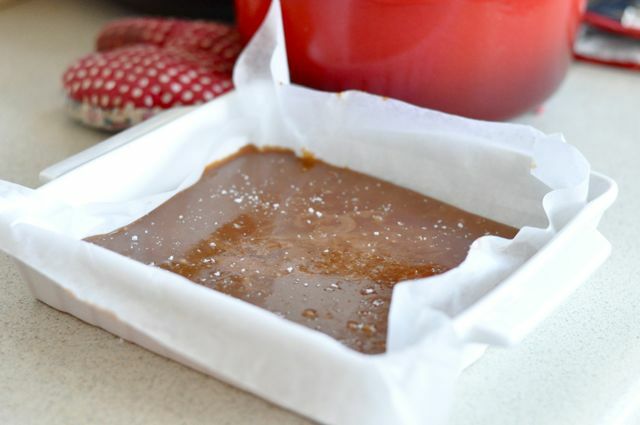 These caramels can be stored at room temperature, between layers of baking paper, for several days. Wrap in cellophane or baking paper so they look all purty. Our Growing Edge – a monthly food link up. Better late sharing than never 😉 I love this idea and thank you for sharing your tips. Yum! I will have to give this a try sometime. Thanks for sharing! Why, thank you for you kind words…..I hope I do bring a smile because lord knows, there are enough people out there who take themselves seriously! Lessons in Letting Go……Lesson One.